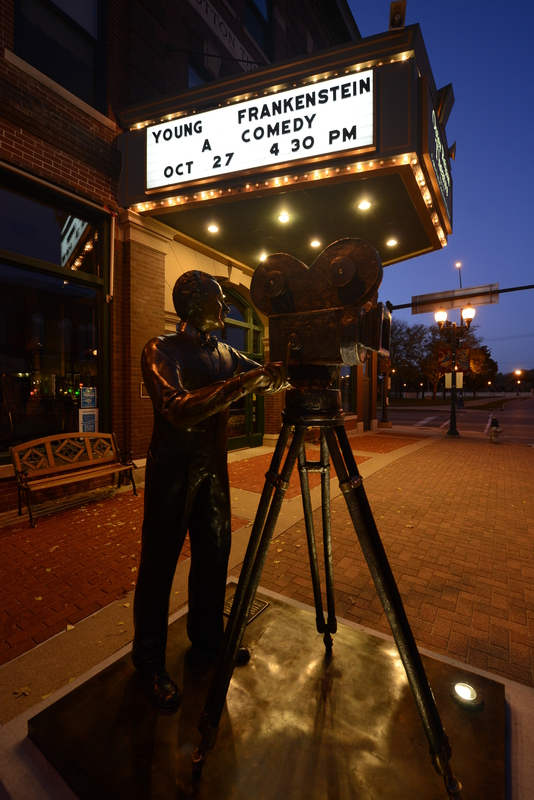 Yesterday I went to see Young Frankenstein at the historic Oster Regent Theater in Cedar Falls, Iowa. It was a good turnout for the 1974 film directed by Mel Brooks. The theater opened in 1910 as the Cotton Theater and is now home to the Cedar Falls Community Theater, as well has a venue for musical groups and occasionally old films. Last month a bronze statue of Merle Blair standing behind a movie camera was unveiled. According to Melody Parker at the Waterloo Courier , “For many years, Merle Blair owned the Regent Theatre when it was a movie theater. Eventually Merle and Winifred Flair and the Beck Trust of Mason City gave the building as a gift to the Cedar Falls Community Theatre.” The sculpture of Blair was created by Loveland, Colorado artist Thelma Weresh. A nice Iowa tie into showing Young Frankenstein the week of Halloween is that Gene Wilder (who co-wrote the script with Brooks and stars as Dr. Frankenstein) went to school at the University of Iowa and Oscar-winner Cloris Leachman (who plays Frau Blücher in the movie) was born and raised in Des Moines, Iowa. P.S. As I’ve pointed out before, two movies have their roots in Cedar Falls. Both Robert Waller (The Bridges of Madison County) and Nancy Price (Sleeping with the Enemy) wrote their novels in Cedar Falls. And this blog started back in 2008 just a few blocks from the Oster Regent Theater. “Always and consciously, I try to hook the audience in the first five minutes. I want them right from the start to feel something—BOOM! I want an explosion right at the beginning. I always what that. So I’m getting in the Christmas spirit this year and thinking about giving away around 100 books I have on writing and film and video production to a local college. A purge of sorts. So today I was sifting through The Screenwriter’s Handbook written by Constance Nash and Virgina Oakey. It was published in 1978 and I imagine I picked it up in LA in the early 80s. Though it was one of the first books on writing I ever bought I don’t think I ever read the whole thing. But this afternoon I did read an interview in the book with actor/writer/director Gene Wilder. Though best known as an actor (he won an Oscar-nomination for his role in The Producers) he actually also recieved an Oscar-nominated for writing Young Frankenstein with Mel Brooks. Less known about Wilder is he attended the University of Iowa—same as screenwriter Diablo Cody who was my inspiration behind starting this blog back in January 2008 after seeing Juno. 1) Start with a Jewish kid born in Brooklyn named Allen Stewart Konigsberg in 1935, and raise him in a strict home where Charlie Chaplin and Bob Hope movies offer a humorous relief. 4) Turn that unpaid newspaper gig into a paid gig writing 50 jokes a day for radio. 5) Turn the radio gig into a well paid TV gigs that end up paying you well working on The Sid Caesar Show and learning from the best of that era; Larry Gilbert, Mel Brooks, Mel Tolkin, Danny Simon (whose brother Neil Simon credits him with teaching him to write), and Sid Caesar. 6) Take the style of black rim glasses from comedian Mike Merrick and wear them your entire life making them your trademark. 8) Start writing movies (What’s New Pussycat) which gets you a WGA nomination, but quickly move into writing and directing (Take the Money and Run) because you want more control. 10) Don’t ride off into the sunset after reaching the top of the mountain with Annie Hall. Continue making films—some good, some not so good— and win your fourth Oscar in 2012 for writing Midnight in Paris. Of course, that’s just the quick ten step overview of his creative journey. There were other people that helped Allen along the way. He was influenced by Mort Sahl, and he was encouraged by his managers Jack Rollins and Charlie Joffe. He learned from cinematographer Gordon Willis and editor Ralph Rosenblum, and no doubt other comedians, actors and production people. And while no one could follow that exact path Allen has taken, he has in turn inspired and influenced a whole new generation of creative people including Larry David, Chris Rock, Edward Burns, and Nora Ephron. You could say his voice (and neuroses) paved the way for their voices. Yet, over his unusally long career, Allen has been able to write and and control the kind of films he’s wanted to make. And his films (including Crimes and Misdemeanors, Manhatten, Zelig, and Radio Days) have grossed over $500 million., and he’s personally collected 17 Oscar-nominations along the way. After I posted the above Goldman comment yesterday on the post titled Writing “Butch Cassidy & the Sundance Kid” it jogged my memory of another story about a career transition—both fictional and real life. 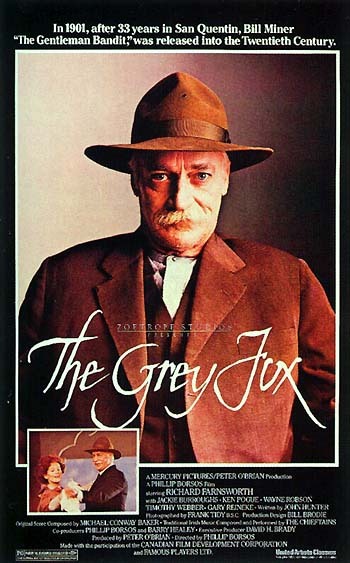 The Grey Fox was released in 1982 about a decade after Butch Cassidy, but there are some similarities, mostly the concept of change in the Old West. Richard Farnsworth plays a former stagecoach robber who is released from San Quintin after serving 33 years for his crimes. When he gets out in 1903 it’s a new world—the stagescoaches are out and movies are in. His character, Bill Miner, goes to see The Great Train Robbery and is inspired to take up his old ways yet with a new fresh angle. Though Farnsworth had been in more than 300 films, they were mostly as a stuntman. He doubled for some of Hollywood’s most well-known actors; Roy Rogers, Gary Cooper, Kirk Douglas, Henry Ford, Montgomery Clift, and Steve McQueen. You think he might have picked up a thing or two about acting from those fellows because after 30 years as a stuntman he began acting. And he did it well enough to receive a Supporting Actor Academy Award nomination in 1979 for his role in Comes a Horseman and another Oscar nomination for Lead Actor in David Lynch’s The Straight Story (that was filmed right here in Iowa). He was 79 at the time of the nomination making him the oldest actor to ever receive a best actor nomination. You may also remember his roles in The Natural, The Two Jakes, and Misery. I had the good fortune to meet Richard Farnsworth at a movie theater in Burbank some time in the 80s. Nothing exciting, he was just standing in front of me waiting to buy popcorn or whatever. He smiled and we shook hands. This was in the days before IMDB so I didn’t know in that simple exchange I was shaking hands with a man who was a real life Forrest Gump in the film industry having been in some legendary Hollywood productions; Gone with the Wind, Gunga Din, The Ten Commandments, The Outlaw Josey Wales, Roots, Bonanza, The Wild One, Blazing Saddles, Spartacus and many others. That means to one degree or another he worked with John Wayne, Clark Gable, Marlon Brando, Mel Brooks, Howard Hawks, Jack Nicholson, Robert Redford, Clint Eastwood and Cecil B. DeMille. I don’t know how long stuntman work on a regular basis in Hollywood, but it has to take its toll on your body. Farnsworth’s last credit as a stuntman was 1975 when he would have been 55. He was almost 60 when his acting career took off. He changed with the times. By the way, the screenwriter of The Grey Fox, John Hunter, was no spring chicken himself and was 71 when the movie was released. Oh yeah, Farnsworth did stunts in Butch Cassidy & the Sundance Kid, too. Chicago-born writer Larry Gelbart died on September 11, 2009 adding one more name to what I’m now officially calling the summer of deaths. Good thing fall starts tomorrow. Gelbart had an incredible career. Just one of his success stories would be an amazing feat, but the fact that he pulled them all off at such a high level is hard to comprehend. He was the co-creator of one of the most popular TV programs of all-time (M*A*S*H), he was co-writer of one very long Broadway show (A Funny Thing Happened on the Way to the Forum), and he c0-wrote one of the most popular and highly regarded comedy movies in the last 30 years (Tootsie). He won an Emmy, a Tony, and had an Oscar nomination. Not bad for a kid from Chicago whose Jewish parents immigrated from Poland. Today is a holiday so to give me a break from blogging I’ll put up some photos I took last week in New York. While the full list of films and TV shows shot in New York City would be quite long, my guess is the exterior of this restaurant is the most recognizable of all of them. Though I was in New York doing camerawork it wasn’t on a Woody Allen film. Just having fun with a free iPhone app.